While teachers in Arizona and Colorado plan to demonstrate later this week to demand higher salaries and greater government investment in the public education system, GOP state lawmakers are aiming to punish protesters, even as new polling shows the majority of Americans support paying teachers more. Several schools in Arizona and Colorado have preemptively canceled classes on Thursday, in anticipation of public school teachers across both states launching walkouts and demonstrations similar to those that have swept through Kentucky, Oklahoma, and West Virginia in recent weeks. Teachers in Arizona plan to walk out as part of the #RedforEd movement. The scheduled walkout comes after they issued a list of demands—including pay increases for all school employees, plus annual raises for teachers; restoring education funding to 2008 levels; and no new tax cuts—to state lawmakers late last month, and promised to protest if the demands were not met. In Colorado, meanwhile, teachers intend to descend on the state Capitol—as they did last week—to call for higher pay and more school funding, and oppose legislation that would slash retirement benefits. Two GOP state senators have responded by introducing a bill that attempts to bar teachers from striking, and threatens to fire, fine, or even jail those who do. Furthermore, the measure would allow a school district to be able to immediately fire a teacher—without a hearing—should they violate a court order prohibiting a strike. If a teacher organization is found in contempt, any collective bargaining agreement they worked on would be rendered null and they would be barred from collecting dues. 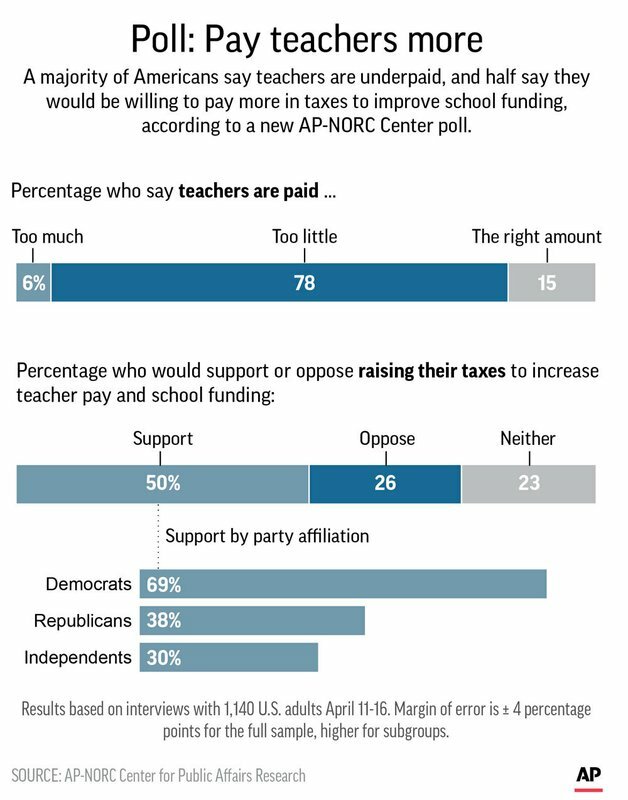 The legislation comes as a poll published Monday by The Associated Press-NORC Center for Public Affairs Research found that a large majority of Americans—78 percent—believe teachers are paid “too little” and a full 50 percent would support raising their taxes to increase teachers’ pay and school funding.